Folks, take a look at this graphic and see if you can spot what’s wrong or incomplete with it – Be careful now! Looks pretty good at first glance doesn’t it? “Church Attendance, Bible Reading, Prayer and Praise” – This will steer new believers straight right? Well not exactly! Let’s take a closer and deeper look at this whole matter of worship that is pleasing to the Father. Fortunately, as in all essential matters encompassing this living walk, our Lord has provided us with direction in His Word. “In Spirit and in truth” – so this cuts to the core of genuine Christian worship, the worship that pleases the Father who is spirit, the kind that He is seeking, the quality and substance of worship that identifies “true worshipers” from false? But is it not the case today, dear friends, that what seems more important is the attainment of a professional “worship leader” or “worship team,” – charismatic and talented individuals who can stir a congregation to great emotional heights, rouse the senses, and impress with their vocal and instrumental ability? Has not this last generation church suffered the worldly temptation of permitting the worship of the Almighty and Awesome God, a God of Spirit, to be reduced to mere fleshly indulgence? It seems to this observer (and forgive me for generalizing to advance my point) that the focus on worship today is primarily on its institutional expression, or collective worship, rather than the intimate and personal expression of adoration as the Holy Spirit brings us to a personal revelation of all that our Lord is and represents. The very idea that one (an individual or a “team”) can orchestrate or manipulate such a response seems strange to me, but maybe I am just the one who is bizarre and out of touch with the ways things should be done. Brethren, as in all matters pertaining to our faithful and pleasing service to God, we must look to Him alone to define what things mean. And invariably He does this by means of His Revealed Word, that has much to say on all foundational matters of the faith. Denominational position statements don’t always reflect the heart of God! The way you have always done it is irrelevant! What we see with our eyes is not truth (the magicians in Egypt were able to replicate many of the Lord’s signs, as will the anti-christ a short time from now). What men teach can only be profitable if they teach from the Holy Scriptures, in the Spirit, to people born anew, and walking in the Spirit. We therefore discover in this Scriptures a distinction being made by the Master between “true worshipers” and false, between worship that is sought by the Heavenly Father (who is spirit and truth) and that which is not. So it follows then, that not all forms or manifestations of worship, even that directed ” in name” or intent to Him is pleasing and acceptable to Him. Not all of those who say they know the true God of Creation and the Bible are in fact known by Him. To come to know the True and Living God, I dare say, is a weighty and mysterious thing. And no I do not have a seven-step program for attaining this knowledge. Yes the Bible plays an important part, but perhaps more important is the work of the Son and the Spirit in making Him known to us. Indeed, the primary reason Jesus came to the earth was to reveal His Father, a role He is continuing to this very day for all who will come to Him in faith. To worship God the Father begins with coming to know Him, and this is something that increases with time, exposure and experience. And it is a uniquely spiritual attainment; the flesh and the world is of no help in this regard. Fellow believers can share their understanding and knowledge of the Lord with us and this can be most edifying and encouraging; yet there are no shortcuts or proxies here my friends, and second-hand experience is no substitute for coming to know Him personally and directly, as we abide in the Lord Jesus Christ and He draws us deeper each day into abiding unity and agreement with the Father. Folks, this devil-wrought delusion whereby individuals are led to believe they are worshiping and serving the True God when in fact they are worshiping and drinking from the cup of demons is a dangerous one indeed. We must be completely sure that such sentiments as these are not referring to us. We must be doubly certain, as only the Spirit can reveal, that the Laodecian trends of the hour, towards religious superficiality, false worship, self-gratifying idolatry, making God into our own image, using Christ and His Church to advance our kingdoms and not His, etc. are not in any manner influencing our living walk. What then, is true worship? Is it only what has come to be known as the ‘worship service’ that precedes the sermon or teaching session? Is it the ‘entertainment’ portion every Sunday morning or Friday night, the part that seems so much more exciting, the ‘singing down’ of God from His heavenly throne, the praising the roof off? Important questions indeed, for have we not ultimately been called and saved to worship, serve and adore our Eternal Lord and God? Is worship not the natural response of a creature who has been so mercifully saved from eternal judgment and brought near to the very heart of the Creator. From the Word we discover that true worship is that which is spiritual (springing from the Holy Spirit abiding within each child of God) and truthful (directed at the true God as He truly is). In this we see that there is no contradiction, as the same Holy Spirit that enables us to apprehend spiritual things (infinity, eternity, omnipresence, omnipotence for example, indeed all attributes of the Most High), is also the Spirit of truth, the Counselor and Helper without whom the twice-born child of God can attain nothing of consequence. True worship can never be rooted in group ritual or isolated from the truth of Almighty God as revealed in His Word. It can never find its source outside of the individual spirit of those who have dedicated their lives to serving and obeying the God of the Bible. If one does not enter into worship with a worshipful heart, then all the loud praises and singing and music in the world will not draw him nearer to the presence of God. Sadly, much of what is called worship in the church today seems contrived and external – a slick combination of Broadway-style production and old-fashioned big-tent mood manipulation. Just as Hollywood has fine-tuned the art of rendering audiences to emotional reaction at will, so the modern church has discovered the assorted tricks and techniques for reproducing such results in the pews. But is it worship, my brother? Does it rise to the level of worshipful expression seen in the Psalms and Prophets for example? Does it represent a sincere prostration of the individual heart before a Being of extraordinary and inestimable Power and Glory. Is it a personal and powerful expression of homage and reverence directed at the true God, the only God, the very Father, Son and Holy Spirit found in the pages of the Bible – as He is and can only be? And finally, has such an expression, however wrought, been informed and shaped by the Spirit and Word of God, and not the best intentions or machinations of men? Perhaps I am mistaken here (and I sincerely hope I am), but do we not see today a church at large estranged from God in their hearts while at one and the same time swept up in what we may accurately call “praise and worship mania“? Can a true and estimable God, demanding sincere and exclusive devotion as He does, present Himself to a people beset by competing loyalties, idols and abomination? I think not. Rather, as we read in Ezekiel, there is a resulting separation and alienation from God and the things of God. No amount of singing, dancing, arm-waving, and hooting and hollering will alter this. No talented and dynamic worship leader can change this. And no perpetual ruminations of “revival” without individual, heart-level, spiritual change (both of the mind (doctrine) and the heart (character), empowered by the Holy Spirit and informed by the Holy Scriptures, will amount to anything but idolatry and false worship. Indeed – if all of this be so, then one must wonder who is benefiting or being blessed as a result of this misplaced worship – is it God or men? These are perhaps the most severest words spoken by our Lord, my brethren. And yet by all accounts there are few who take them seriously. Worship today is more often an emotion-soaked mood than an honest and reverential posture in the presence of pure and absolute Glory. It is often allowed by church leaders to become an orchestrated and unquestioned experience, rather than the spontaneous and profound expression of praise, thanks and wonder that grips the soul at the revelation of Pure Life and Light! Doctrine and scriptural relevance of any kind is seen by many as confounding and thus, limiting to such an experience. Yet our Lord permitted no such demarcation between doctrine and worship. In His eternal wisdom, bad doctrine implied vain worship, for one cannot truly worship what one doesn’t know. Definition is, as we observe, important after all. It is not all we have certainly, but it – what we may consider the technicalities of our faith – serves to inform and structure all that we have and are in the faith, before God and each other. It contains emotion when emotion spills over into the unreal and unspiritual. Mere sentiment or sensation is so much like the impetuous teenager who sees a pretty face and cries out “I love you” with great passion and spontaneity. For one to argue that it is the passion or the spontaneity of this moment that proves the integrity of the love, would be erroneous. And yet, this is precisely what is going on in the modern ‘Praise and Worship’ movement. We need to be sure that anything representing the true worship of our Eternal Lord is not based on the inclinations of men or “big ministry” mood manipulators who deal more in brash spectacle than the truth and reality of Almighty God. It seems the theme of the hour in “Christian” circles is worshipping God; and every church, pastor, teacher and denomination in North America has their own take on the most effective and “anointed” manner in which to carry this out. May I be so bold therefore as to suggest that there can be no true worship of the Most High and Holy One without holiness in the life of the worshipper? For all those with ears to hear and eyes lit by the light of God, the Spirit affirms the integral bond between holiness in the life of the believer and the worship of a Holy God. For without the one, you cannot truly have the other. Holiness makes worship happen as naturally and as automatically as the wind kisses the water to make the wave. It is not some mechanical or compelled response, nor can it be. Many have tried to define “holiness,” both biblically and otherwise, and truly it is an onerous task. Personally, I have most benefited from a series of sermons delivered by A.W. Tozer on the attributes of God, one of which offered a wonderful examination on His Holiness. Humbly and with the greatest of gravity, Tozer probed behind the temple veil to enlighten his audience as to what in fact makes God “holy,” and unlike us in every moral and spiritual aspect. Truly, holiness is an ideal and indeed, the highest one. It is certainly the state or manner of “God-likeness” (or Christ-likeness if you prefer). It encompasses both an uncompromised moral quality and spiritual purity. It was the state Jehovah intended for ancient Israel, and it is clearly presented in the New Testament as the ideal for the Bride of Christ. What is in His heart? How would He have me relate to Himself and other human beings? What does He think about this? What does He love and approve of? What fills His heart with joy and gratification? What does He want for my life, my time, my resources? What are His values and ideals? How does He see me? The world? And I hope you see that what we are talking about what could be called a “practical holiness,” not merely the mystical and sentimental variety being stressed in the church today (and no, this writer is by no means against authentic spirituality or the supernatural). It grieves me to see that so much of what is called worship in the church today amounts to little more than an affective (based on feelings, desires, emotions, etc.) religious zeal; more psycho-social hoopla than a spirit-informed response to the Lord acting on their inner being. Please do not forget, dear friend, that mere sentiment without substance amounts to little more than magic and self-gratifying religion, not God-glorifying, God-gratifying holiness. Continuing, we should also stress what Charles Spurgeon did, when he passionately taught that justification (the act of redemption) without resulting sanctification (holiness in living), is self-delusion, a self-serving (and hell-serving) perversion of the doctrine of grace. We too are a type of “holy priesthood,” representing a Lord and God who is quintessentially and perfectly…holy. How perfect and wondrous the universe will be when every person, beast and thing will again be dedicated exclusively to the design and integrity of the Infinite and Perfect God, when order is restored to that most tangled garden. Our lives are to be consecrated to the service of God. From the moment we accept Jesus Christ as Sovereign and Shepherd of our lives, we cease to live to ourselves so that we might live solely to Him. Our “bodies” are the vehicle for all moral activity, through which we fulfill our identity as either self-serving, godless people or authentic worshipers of the Living God. And it is holiness that is the truest mark of a life devoted to God. And holiness can never rightly be measured by esoteric or ritual observance, but in the discipline and duty of everyday moral experience. This is the true worship of God, when we finally remember that we have been chosen by Him as ambassadors and representatives of a higher kingdom. So we can conclude that holiness is founded on the fact that, as Christians, we represent Jesus Christ, who is Holy and who is God. 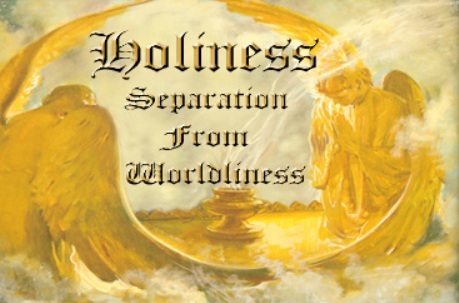 Holiness then, is a mark of identification, a badge or seal, communicating to all the world that we belong to, and represent the Holy One. Romans 6:19 – For just as you presented your members as slaves of uncleanness, and of lawlessness leading to more lawlessness, so now present your members as slaves of righteousness for holiness! Often in the New Testament holiness is coupled with righteousness, and portrayed in combination as the sign of the new birth. Jesus taught at great length about the conduct required of the “new man,” about the need for exclusive devotion to the Holy Father, about where our heart-felt commitments should lie. Many other passages (that I encourage you to wrestle with) present holiness and righteousness as deep-rooted, concomitant outgrowths of the sanctified life. Moral purity, sanctity, cleanness in the “inner vessel,” integrity of word, motive and conduct…all these represent what one is. They do not operate at the level of feelings and emotions, although they decidedly influence the realm of the emotional. Serious business, this thing called holiness. Which is why it is so strange that in modern Christendom it is more often represented as a kind of garb that we put on, much like a pair of pants or shoes; why music and song and chanting and every form of mass emotive experience is seen as being able to arouse “worshipful” qualities in those participating; why sanctification is redefined as some kind of split-second, on-the-spot transformation rather than the life-long, moment-to-moment, often quiet transformation of a self-dead heart committed to a Holy God. “Instant Holiness Now Possible” is the banner message of the hour, differing little from the claims of instant weight loss or a happy marriage. Or perhaps even more subtle and subversive to the truth are the countless “christianized” psychology messages emphasizing the need for layered or step-by-step behavioral change. Seven steps to experiencing God, three things you must do order to be physically healed, 12 steps to breaking the chains of addiction…all so neat and tidy my brethren, but none of it scriptural, none of it ordained by the author and Finisher of our faith. Sin requires far more than this, and the devil laughs such puny efforts to scorn to be sure! Beware, dear reader, for holiness can never come in a bottle or a manual, but only from the Holy One Himself. And it returns to Him, and glorifies Him (herein lies true worship), as others see His holiness reflected in all that you say and do and represent. It flows out from His very essence, transforming your life in very practical ways, and it leads you to your knees and to prayer and to that quiet contemplation of all that He is and represents. When the Bible refers to the “beauty of holiness” it knows of what it speaks, for indeed holiness is beautiful, more beautiful than anything our eyes can render, or our poetic insights can attain. 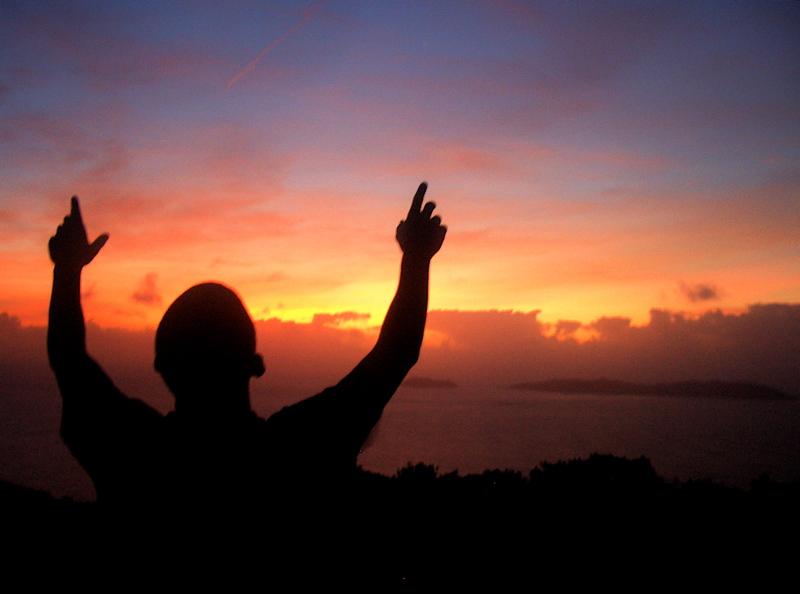 It is, after all, holiness that makes worship real and honest. All of the wonderful spirit-breathed sentiment springing forth from a reconciled heart, the peace and consolation, the unrecognizable joy, the priceless order that results as our lives become synchronized with the original plan, the passion of meaningful service – I for one will take all of this over the artificial and momentary arousal being peddled in the big church on the corner. For I need no drunkard’s morning-after, and the hollow sense of longing that it brings. I need no drug-like stupor with all of its carnal side effects and insatiable need for more. What I need is to be holy for He is holy, and this, my friend, should be true for all of us. Oh Most High and Holy Father – Help us Great Father to see how much you are blessed when your children present themselves to worship You in spirit and in truth; when all of our lives reflect your holiness and purity. Grant dear Lord that no longer would we settle for anything else or less than what pleases you and your Beloved Son in whom You are well pleased. In His name alone we pray, Amen. Please pray for us here at Living-Walk, that we would watch and see the Master at work, and understand what He would have us do.